AFTER a few years of planning and spreading the word, Ponteland has been recognised for supporting a worldwide movement. Ponteland is now officially a Fairtrade Town and the accolade came just in time for its celebrations during Fairtrade Fortnight. All four churches in Ponteland have a Fairtrade stall supplied by Traidcraft, a company set up by Christians about 25 years ago to offer an alternative way to trade with the developing world that did not exploit people. Steve and Angela Helm, who ran the stall in St Matthew’s Church, went to South Africa on a holiday organised to visit the Fairtrade producers in that country and they came back enthused by the difference it had made to communities. After speaking to then Ponteland Mayor Robin Ramsay in 2009 about their experience, Mr Helm was asked if he would like to help make Ponteland a Fairtrade Town. He agreed and began to collect evidence to satisfy the five goals it needed to meet. The first involved Ponteland Town Council backing and it was readily given with Fairtrade tea and coffee made available for all meetings of the authority. Shops and catering establishments had to be invited to sell the products and the required numbers of outlets were gradually persuaded over a two-year period. Next churches, schools and community organisations had to be involved. The churches were already on board and most schools were interested in Fairtrade – Ponteland High School was the first to get Fairtrade School status last month. Several local clubs and societies agreed to serve Fairtrade tea and coffee. The final two goals were setting up a Ponteland Fairtrade Steering Group, with representatives from a range of organisations in the town, and putting on some events during Fairtrade Fortnight to publicise the movement. Mr Helm, Chairman of the steering group, said: “Getting Fairtrade Town status for Ponteland means that residents who buy Fairtrade products have been recognised as making a significant difference in the growth of Fairtrade. 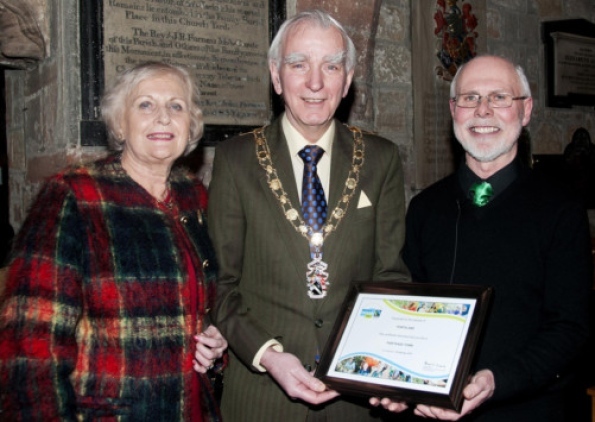 “It also recognises the efforts of those who have campaigned for Fairtrade in the town. Mr Helm presented the certificate from the Fairtrade Foundation to current Ponteland Mayor Peter Cowey at a packed concert featuring the Caedmon Choir in St Mary’s Church to launch Fairtrade Fortnight. Coun Cowey thanked the steering group for its work to achieve the status. Big Brews were also held during the fortnight, which ended on Sunday, to sell Fairtrade products and raise awareness. All of these goods have the Fairtrade Mark on the packaging, which indicates that the producers and workers have received a living wage, improved working conditions and additional benefits for their communities.